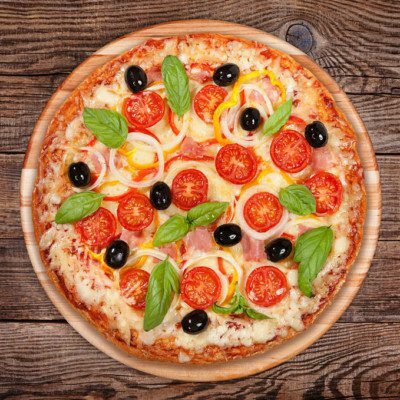 Gluten-free pizza is pizza that is not made from wheat flour and contains less than 20 ppm of gluten.1 Besides wheat, other cereals containing gluten are rye, barley, triticale, and spelt. Gluten-free pizzas are developed for people who suffer from celiac disease. Gluten is one of the most important structure-building proteins responsible for the appealing quality and structure of wheat-based products. Its unique viscoelastic properties render the development of gluten-free dough that has similar quality and structural properties a highly challenging task. Pizza dough produced from gluten-free formulations lacks a cohesive and elastic nature due to the absence of gluten. In the recent past, various alternative approaches have been adopted to modify functional attributes necessary for gluten-free pizza development. Enzymes have been applied for improving dough rheological characteristics or dough-handling properties and for shelf-life extension of gluten-free products. Transglutaminase can be used for polymerizing proteins from one or more sources through the formation of intermolecular cross-links. Transglutaminase has successfully improved the rheological and handling properties of oat dough and rice dough. Glucose oxidase is a popular oxidizing enzyme used in the food industry. It has been shown to enhance the elastic-like properties of sorghum, corn, and rice flours. Amylase can modify gluten-free batter through hydrolysis, oxidation, or a protein cross-linking reaction, resulting in improvement of rheological properties and related product attributes. Cyclodextrin glycosyltransferase (CGTase) (EC 2.4.1.19) can modify the pasting properties of different starches by converting starch and related sugars into cyclodextrins (CDs). CDs have the ability to entrap hydrophobic molecules in their internal cavity and act as a “molecular container.” Addition of CGTase to rice flour is known to affect its rheological properties. Tyrosinase and laccase are oxidative enzymes capable of catalyzing cross-linking biopolymers via their phenolic moieties. These enzymes can contribute in improving the viscoelastic properties of gluten-free pizza dough by the formation of covalent bonds within or between cereal biopolymers. U S Food and Drug Administration. Allergens – Questions and Answers: Gluten-Free Food Labeling Final Rule. US FDA Home Page. Center for Food Safety and Applied Nutrition, Office of Regulatory Affairs, 2 May 2016. www.fda.gov/Food/GuidanceRegulation/GuidanceDocumentsRegulatoryInformation/Allergens/ucm362880.htm. Accessed 14 July 2017. Singh D.N., Deswal A., Mishra H.N. Alternative approaches towards gluten-free dough development: recent trends. Food Engineering Reviews 6.3 (2014):89-104. Bakerpedia. Gluten-Free | Baking Processes. https://bakerpedia.com/processes/gluten-free/. Accessed 15 July 2017.